Come see samples at SHOT Show! Raine Inc. is looking forward to seeing you at our two booth locations. We are currently looking for dealers, distributors, companies that would like to have us integrate Raine designs into their product lines, and contract sewing customers. Email us at shotshow@raineinc.com to schedule a meeting. You can find out more at the Kickstarter campaign page. Get the latest info. on our current project: Raine MOLLE Cover for Tubes™ cummerbunds to give you back the MOLLE real-estate lost from using FirstSpear® Tubes™ quick release hardware on a plate carrier and body armor vest. It’s almost time to start thinking of 2018… You know what that means? SHOT Show is coming up January 23-26, 2018 at Sands Expo Center in Las Vegas, celebrating their 40th year! Raine Inc. will be at Booth #20132 so make sure to stop by & see us! We carry tactical gear to stow your stuff on the go. We also offer sewing production capacity for projects involving 50-100 units and larger runs. See this OEM info for further production detail for your next project. Visit the Raine TACTICAL website for order info or call us at 1-800-826-5354. In addition, Raine Inc. offers a variety of products in their Raine TACTICAL line, superior high end gear to be used up to the Tier One level. Made in the USA and Berry Compliant. 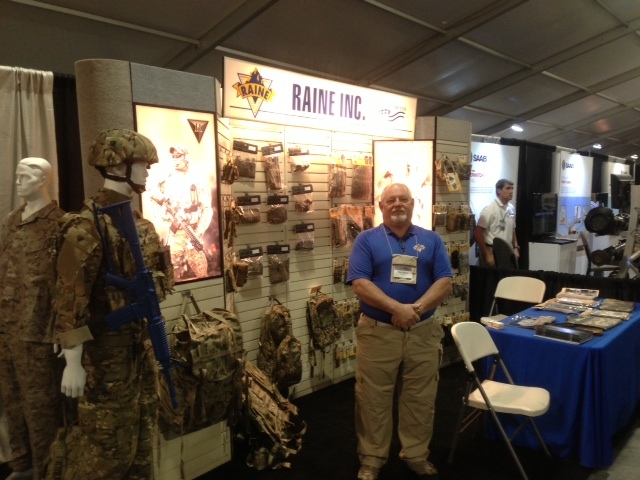 Raine Inc. exhibited products at the annual January SHOT Show in Las Vegas. This event showcases the product lines for several hundred exhibiting companies with heavy emphasis on new products developed over the last year. Raine was in the Law Enforcement section of the show, which is the show’s fastest growing category. When Ron James, Raine’s Business Manager, first started doing the show, we were one of the first companies to exhibit in the newly formed Law Enforcement section. 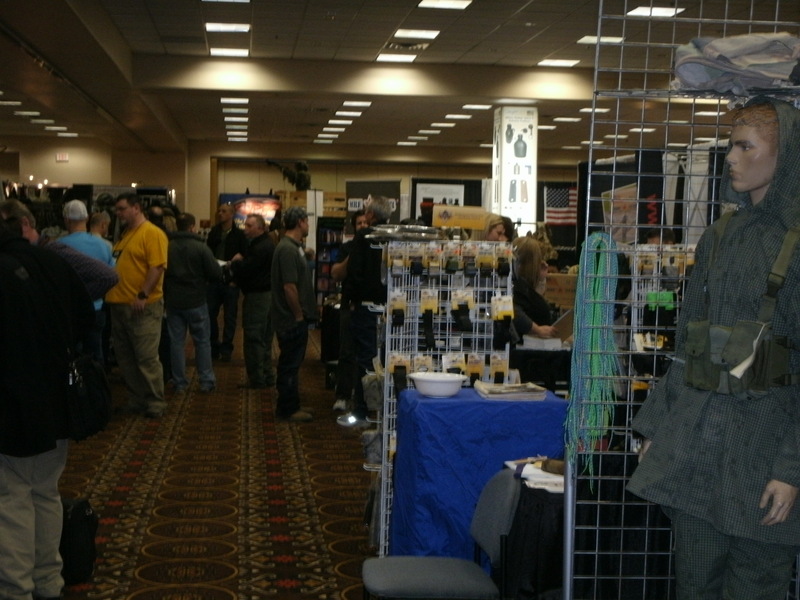 There was about thirty vendors on three aisles of floor space in the lower section of the Sands Convention Center. This year, there were probably ten times the number from the first show taking up two ballrooms in the Palazzo Hotel and several convention meeting rooms in the lower level. If you are a retailer of law enforcement items, a law enforcement professional or a military service member, you should try to attend one of these shows. The floor traffic at this show was heavier than it has been for several years. We hope this bodes well for a turn-around in our industry. Even though our efforts in Afghanistan and Iraq are winding down, there was still a great deal of interest in our military gear; especially our new products in our Raine BLACK line. If you haven’t had a chance to see those items, view them at www.raineblack.com. There were a number of businesses interested in Raine doing custom work for them. This is an important part of what we offer to our customers. Our military business and product development guys (Will Romes and Dan Wilson) were quite busy all week talking to companies both foreign and domestic needing custom work. This year, for the first time, we shared our booth with another company, Outdoor Tactical Enterprises. 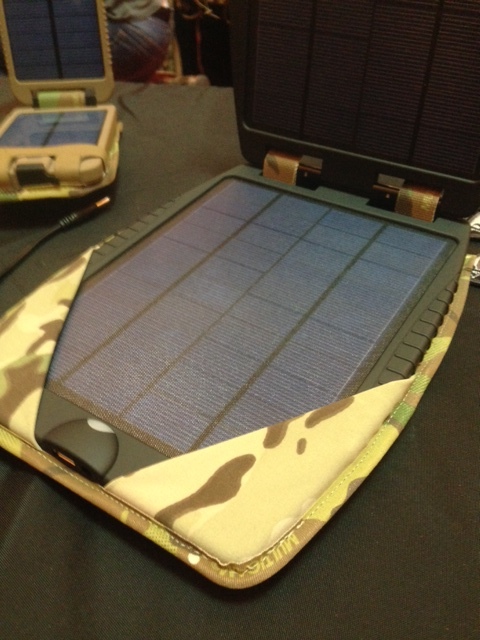 They distribute a solar charging system called the Power Traveler. We are making a series of holders for their products which can be attached to vests, backpacks, etc. Traffic was good for them and the cross-over was good for both of us. We also highlighted a company located in Anderson, and showed their new tactical individual protection shield they have developed and are using a case we designed. It was great to see a spirited reception of their product. We hope this activity leads to good things for Raine, which will ultimately benefit our customers as well. Great to see old friends and make new contacts! 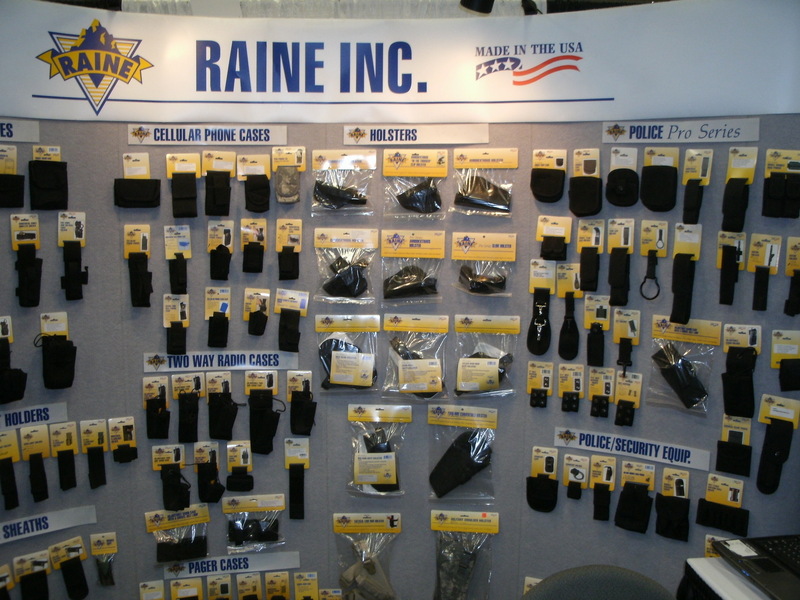 Raine Inc. manufactures over 500 products- from nylon military field gear, law enforcement equipment, cell phone cases, radio cases, paramedic pouches, police duty gear, ID holders, equipment belts, holsters, sports bags to tool pouches for tough field use. 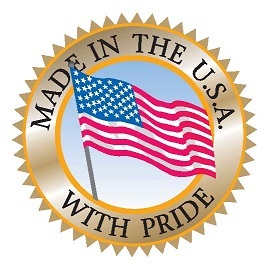 Raine’s products are Made in the USA and Berry Compliant, and more info can be found at: http://raineinc.com. The Shooting, Hunting and Outdoor Trade ShowSM (SHOT Show®) and Conference is going on now until January 17th. Check out Raine Inc. BLACK at Booth #20656. See the new Powertraveler covers Raine BLACK is doing for Powertraveler and OTE. These covers are already rugged so we took a high-end fabric, minimalist approach and added our touch. The big cover is done with 4-way stretch Tweave, while the little one incorporates some of Raine BLACK’s laser cut Vector fabric. Raine Inc. offers a variety of products in their Raine BLACK line, superior high end gear to be used up to the Tier One level and is Berry Complaint. For more product info., go to www.raineblack.com. Follow Raine BLACK on Instagram to see firsthand about the latest projects. The Modern Day Marine Exposition is going on September 24-26, 2013 in Quantico, Virginia. The Modern Day Marine highlights top military equipment, systems, services and technology designed for the U.S. Marine Corps. Shown here is Ron James, Raine Inc.’s Business Manager with Greg Graves from Propper International. Raine Inc. is showcasing Raine’s BLACK newest products including the combination Single Mag Pouch and Dump Pouch which can be viewed at http://raineinc.com/catalog/advanced_search_result.php?keywords=dump+pouch. Stop by if you are there at Booth 1047. To view the latest Single Mag Pouch and Dump Pouch write-up from Soldier Systems go to http://soldiersystems.net/2013/09/24/mdm-raine-inc/. This product is Made in the USA and Berry Compliant. This September 10th and 11th, Check Out Raine Inc. and Raine BLACK at the Maneuver Warfighter Conference in Fort Benning, Georgia at Booth 240. 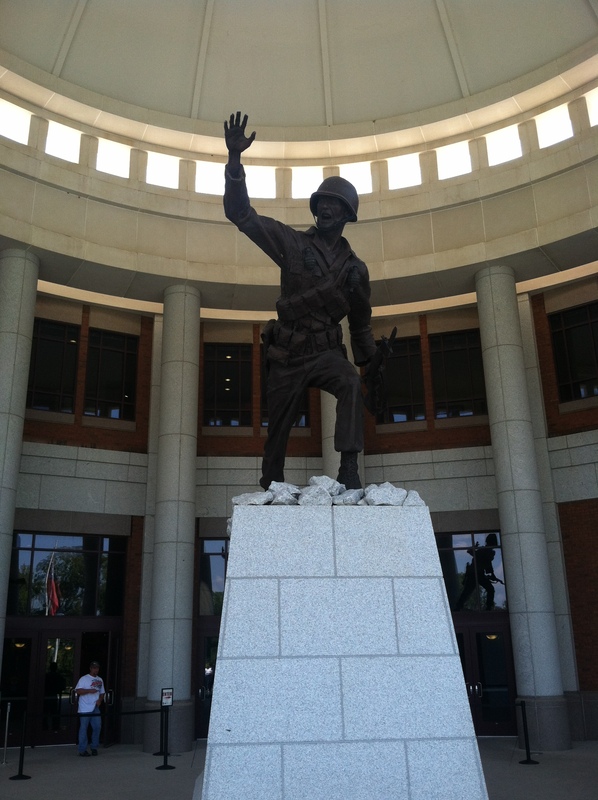 Fort Benning is home of the infantry, airborne school, armor school and ranger training battalion. This picture is just outside the Maneuver Center Of Excellence (MCOE). Check out the Raine BLACK line, Vector LCP and SOF LCS kit on display. ANME Expo Recap: All Worth It! 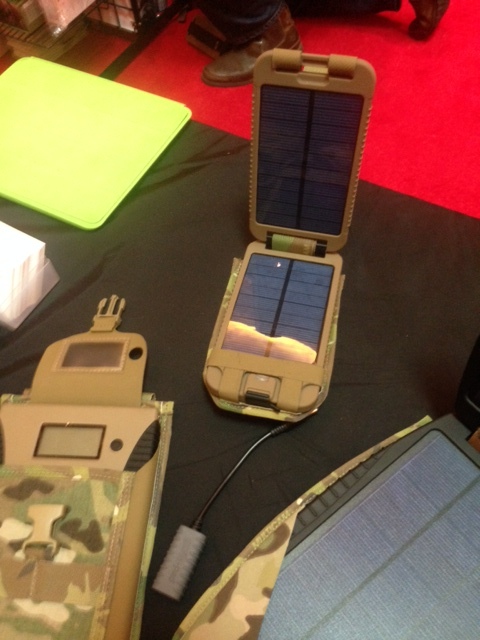 Thank you to everyone who attended the Army Navy Military Expo in January. In the thirteen plus years that I have been going to Las Vegas, this year had to be the coldest! 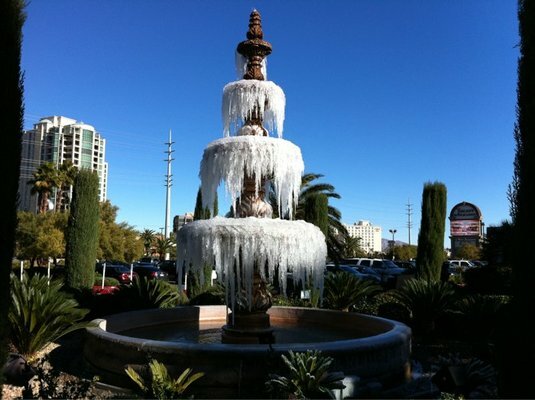 Check out the water fountain in front of the Tuscany! I am very happy that I stayed at the Tuscany and did not have to do a lot of walking outside on this trip. Leave it to me to leave my coat in the backseat of the car back in Indiana! Overall, the show was successful for Raine Inc. ANME is a wonderful opportunity to showcase Raine’s product line to prospective dealers as well as introduce new products to our current dealers. It seems that this show gets busier every year. I didn’t really have a chance to walk the entire show floor but from what I could tell there were several new vendors and foot traffic was steady. As Ron stated in an earlier post, this show is very reminiscent of the good old days when the ASD Show was at the Hilton. The vendors at ANME are all relative to the Army Navy market. I look forward to this show every year. Everyone that knows me knows that Las Vegas is my favorite place to be. It’s more than just being in Vegas. It’s always a pleasure to see old friends at this show and have a chance to meet new friends as well. I have a chance to put a face with the voice that I have been speaking with over the phone. The expo has outgrown the space available at the Tuscany and is moving to the Rio Hotel & Casino, Las Vegas next year. I look forward to seeing everyone at the Rio next January. Let’s all hope for warmer weather next time! The 2013 SHOT Show is now is history and we are already thinking about the 2014 show. By most measures, this was a very successful show. If even a small percentage of the opportunities come to fruition it will be one of our most successful shows ever. We introduced our new BLACK line to rave reviews. My early thoughts were that the line would be primarily of interest to military groups, but there was a good amount of interest among the civilian dealers who saw it. One of my old friends from Texas ordered some and a new customer from Florida added some as well. It was great to be back in Vegas to see our friends in the industry again. I also spent a day at the ANMExpo at the Tuscany. That show reminds me of how the surplus shows used to be years ago. If you are a Raine customer and used to attend the ASD shows in the Hilton, but haven’t tried the ANMExpo, you need to go next year. It will be at the Rio and will really take you back to the old days. From left to right: John Raine, Craig Sawyer of Discovery Channel’s Top Shot and Will Romes. Thanks for your business in 2012. I hope 2013 will be a good year for everyone. Raine Inc. will be at booth # 20656 in the main law enforcement hall for this year’s SHOT Show January 15 – 18 in Las Vegas. Show hours are 8:30 to 5:30 Tuesday, Wednesday, Thursday and 8:30 to 4:00 on Friday. 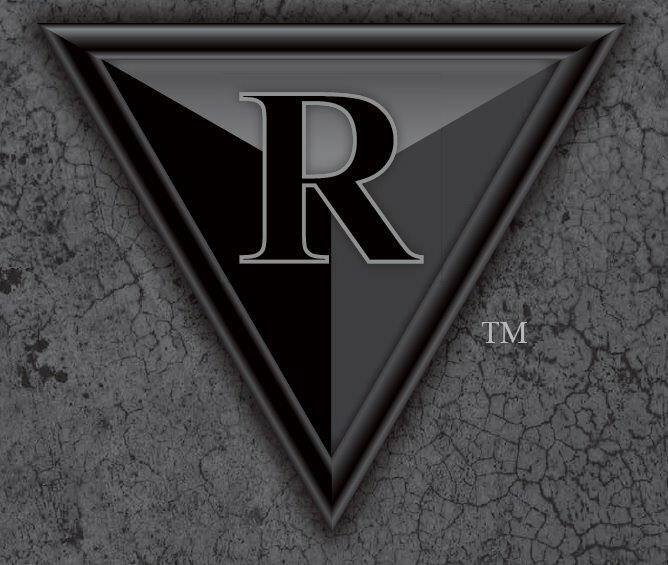 Raine will be introducing our new BLACK line of tactical gear at the show. Craig Sawyer of the Discovery Channel show Top Shot will be in the booth from 3:30 to close on Tuesday. 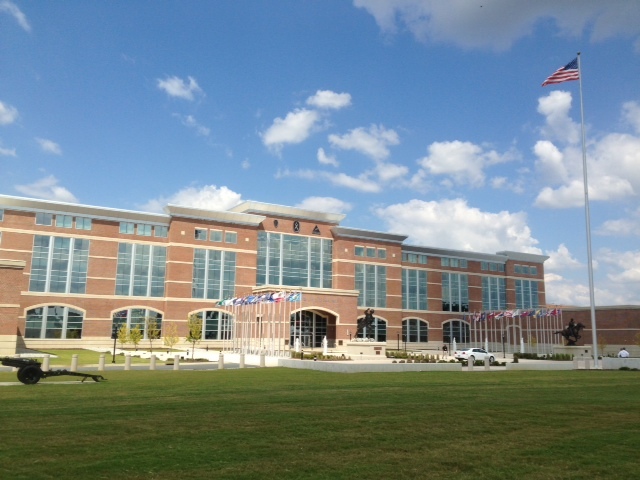 As most of you know, the Maneuver Center of Excellence Exposition (MCE) at Ft. Benning was this week. Raine wanted to share some photos from the event. 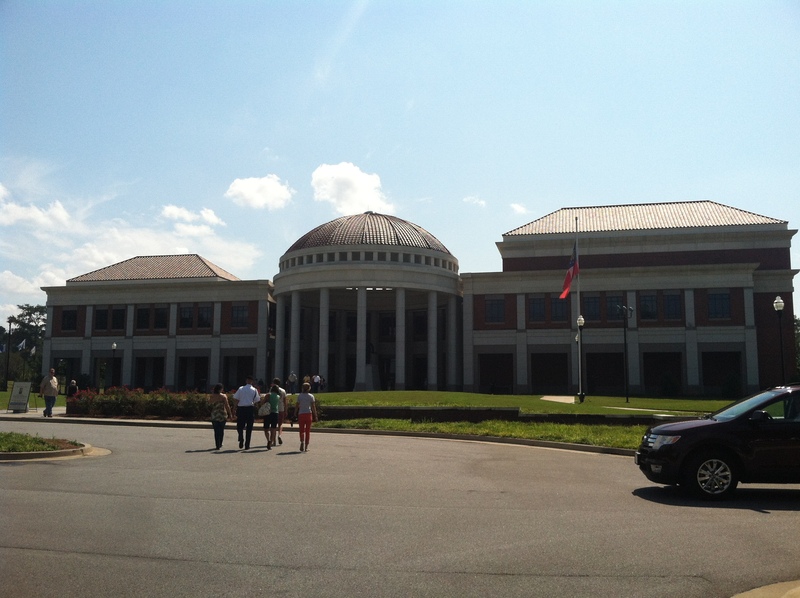 This picture shows the Infantry Museum building which is outside the main gate at Ft. Benning. 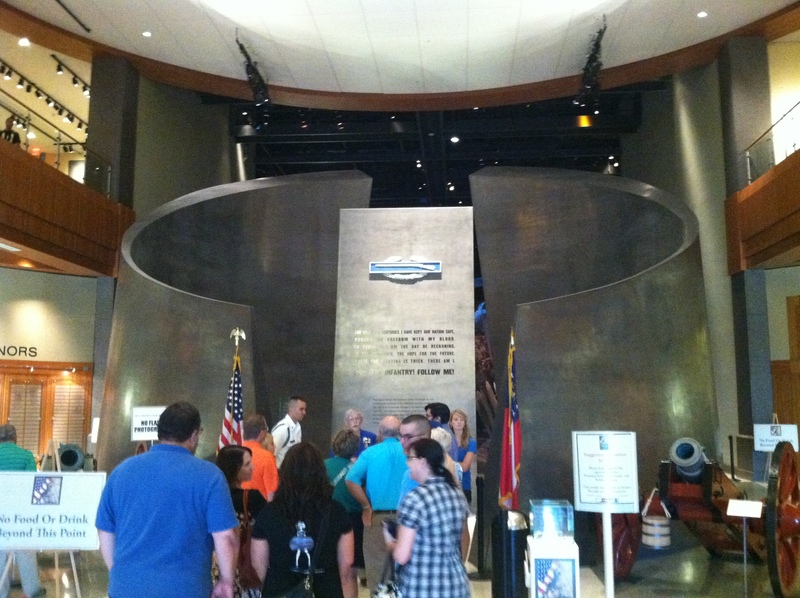 Here is the entry to Infantry Hall highlighting the Combat Infantry Badge. Last but not least is an Iron Mike statue. We enjoyed meeting some of you and seeing again so many men and women committed to defending our country.